Now, if a player removes the joker, do they have to replace it with another 4? The Joker has poorly written rules, and the version of the rules you are playing by matters. First of all, sets of 4 tiles are never required to remain as 4 tiles, the minimum of 3 tiles is the only requirement. So a fourth tile can always be removed from a set without needing to be replaced. A joker can be retrieved from a set on the table by a player who can replace it during his turn with a tile of the same numerical value and color it represents. The tile used to replace the Joker must come from a player's rack and not from the table. This version is very restrictive, and even though it says can and not must, it does not provide any alternative examples of how to clear the Joker. So if you want to play in a way where the Joker MUST be replaced no matter what, then these are the rules you want to follow. But the game has been improved since then, so I suggest following the new rules. It makes for much more interesting manipulation of the table, where the fun of the game lies. A joker can be retrieved from a set by replacing it with a tile of the same numerical value and colour it represents. The tile used to replace the joker can come from the player's rack or from the table. Notice the small update there so that Jokers may be cleared now either from the rack or from another tile on the table. The rest is still worded the same but it does say can instead of must. There is nothing in the rules that differentiate between Jokers in groups and runs, so the fact that example 1 shows replacing in a group should not be taken to mean that Jokers in groups must be replaced but Jokers in runs do not need replacing. If Jokers in runs do not always need replacing, then Jokers in groups do not always need replacing. @2:30 "You can clear the Joker with tiles from your rack, or by manipulating the table." 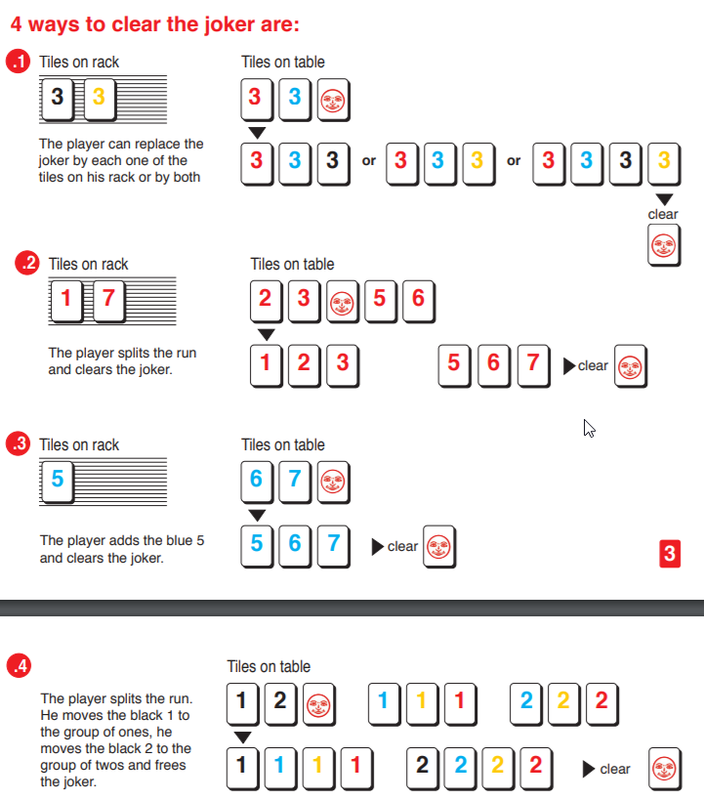 @2:45 "Cleared Jokers on the table are waiting to be used again, as long as 3 tiles remain in every set"
While explaining, the video shows the same example (#2) in the image above. There is no mention of needing to replace the Joker. That line has been updated to simply say "as long as 3 tiles remain in every set" as the only requirement. Sometimes you have to replace to achieve that, but not always. Sets containing jokers may be split and manipulated like regular sets. So if the Joker (or any tile) is a fourth tile of a set, then it can be removed without needing to be replaced. No, a group has at least 3 members. So a group of 444 (of different colors) is still a valid group. If you follow the rules to the letter, you have to replace the joker. But according to my common sense, if you remove the joker, there is still a valid group left so it must be possible. Besides, a sane player wouldn't have left the joker in such a position. Sorry to disagree with you. All the people that I play with agree that if you clear a joker from a group you must replace it with the number you replaced it with either in a 3 tile group or 4 tile group. Not the answer you're looking for? Browse other questions tagged rummikub or ask your own question. Do you have to play a (replaced) joker immediately with 2 tiles from your hand? Does a Joker has the value of the number it represents? When a player gets Rummikub & the round is over, how is play continued?